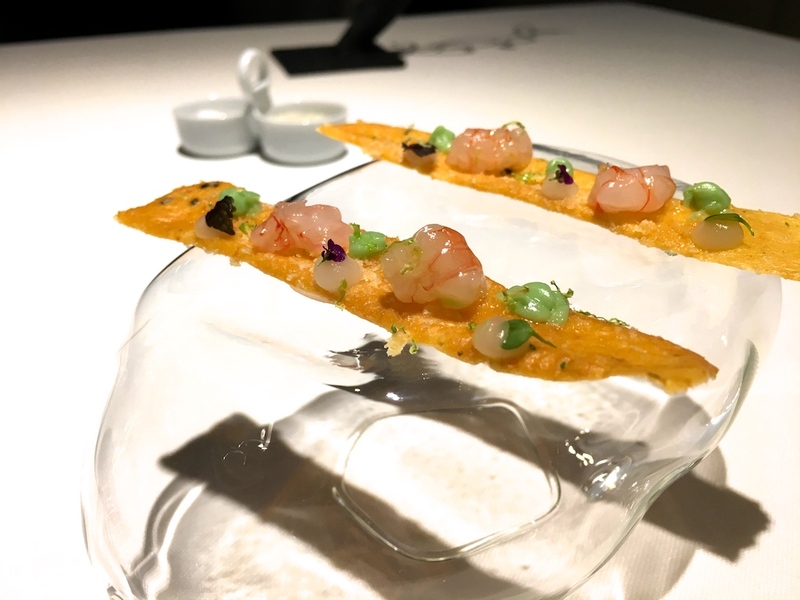 In the latest edition of the Michelin guide for Spain and Portugal, Restaurante Lasarte ("Lasarte") in Barcelona was awarded three Michelin stars, taking the total number of three-star restaurants in Spain to nine. 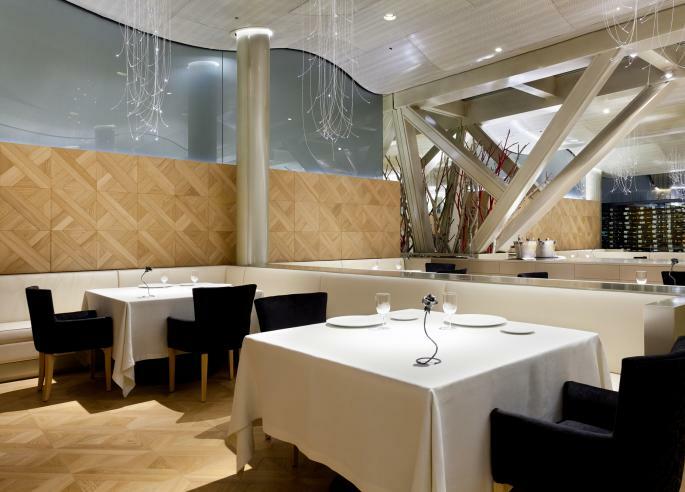 Lasarte, part of the Martin Berasategui restaurant group, opened its doors in 2006. Chef de Cuisine at Lasarte is Paolo Casagrande (b. 1979), who has worked together with Marin Berasategui for more than a decade. 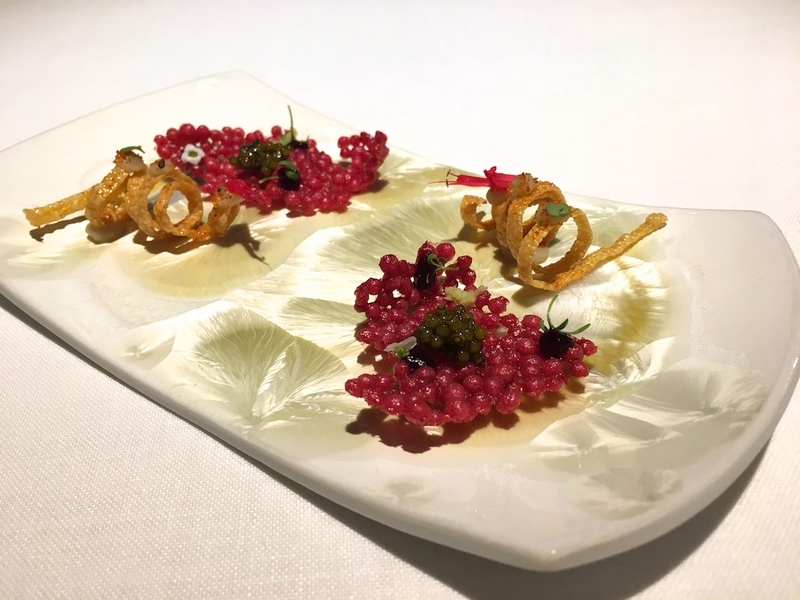 He has been running the kitchen at Lasarte since 2012, but before that he also worked at Berasategui's flagship restaurant in the Basque country, and at the Michelin starred M.B. in Tenerife. My last visit to Lasarte was already five years ago (see my 2012 review). The recent (2016) complete makeover of the dining room and the restaurant's new three-star status were an excellent excuse for a revisit. Lasarte is open for lunch and dinner Tuesday through Saturday and the restaurant offers an à la carte menu (starters €30 - €41, mains €49 - €70, desserts €25 - €34) and two tasting menus, one with 11 courses and priced at €210 and one with 7 courses for €185. I had lunch with my husband at Lasarte in February 2017 and we both ordered 3 courses from the à la carte menu plus one extra course to share. Lunch started with a selection of four appetisers, the first two being a beetroot tapioca cracker topped with beetroot puree, wasabi and caviar, and a spiral Jerusalem artichoke crisp topped with Jerusalem artichoke puree and some chilli powder. Two delicious bites and a promising start of the meal. 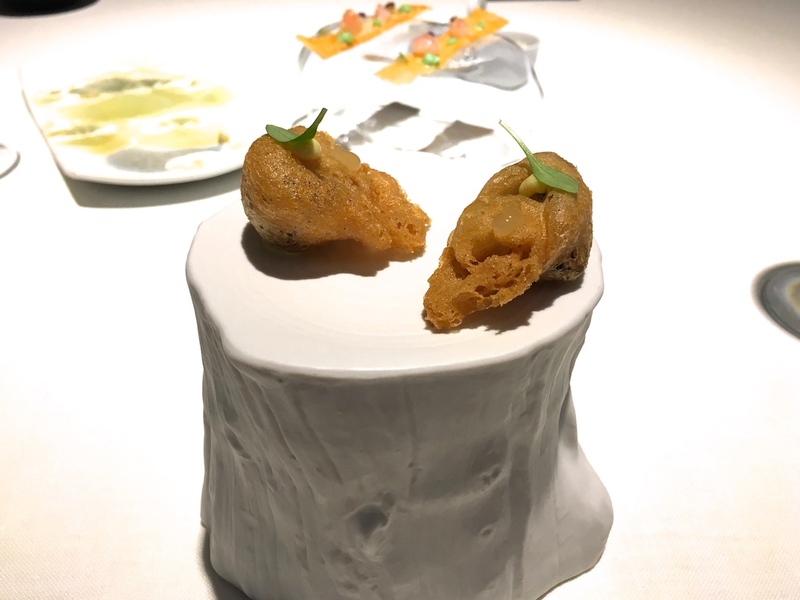 Equally lovely were the next two: some crisp "bread" (a bit like a fritter) with a soft neck sweetbread (pork) filling, garnished with some yuzu mayonnaise, and a thin tomato-flavoured crisp garnished with pieces of raw prawn and dots of green curry crème. 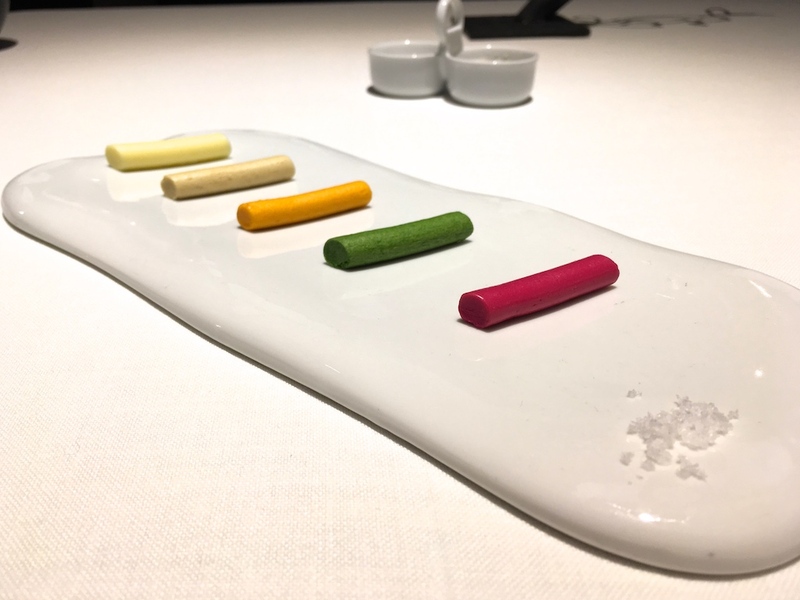 Next we were offered a choice of Lasarte's bread collection, which was served with the restaurant's signature butter selection (beetroot, spinach, tomato, mushroom and unsalted). Finally there were two more appetisers. 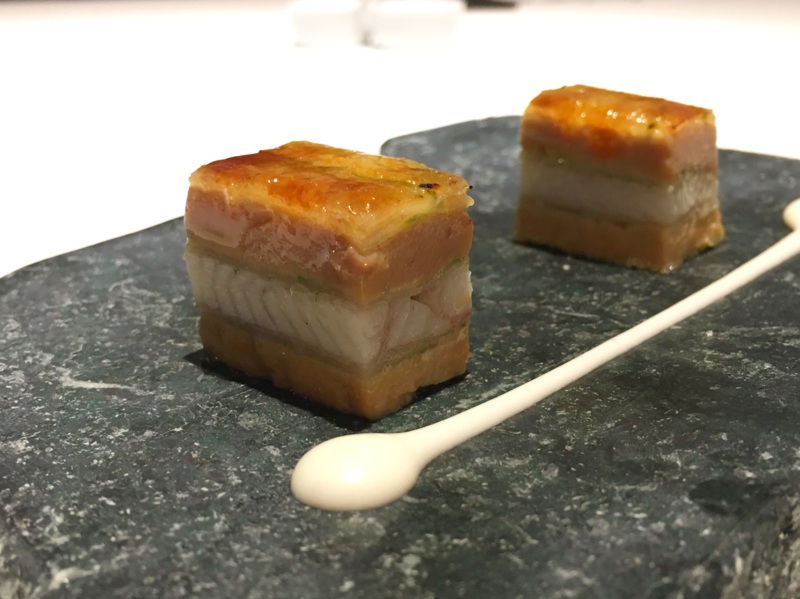 First up was Martín Berasategui's famous foie gras, eel, and caramelised green apple mille feuille, served today with an onion crème sauce. A truly superb bite with amazing textural contrast, the firm foie gras against the soft and melting eel, and a little crunch from the tuile. 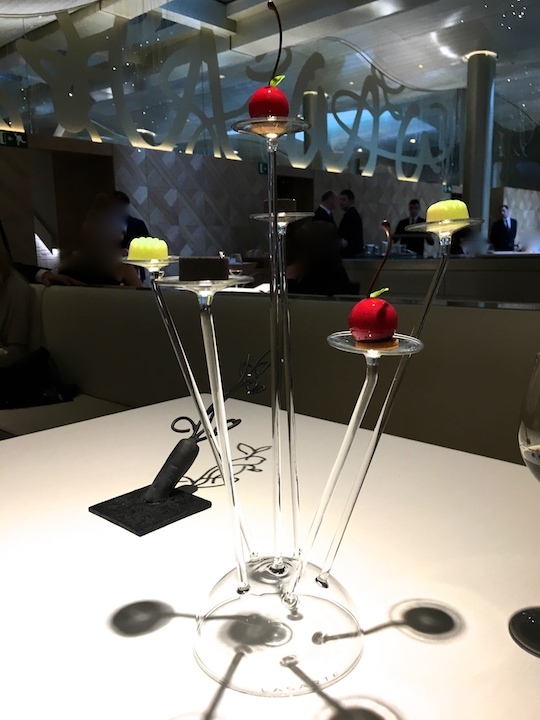 I had had this bite before at Berasategui's flagship restaurant in Lasarte, and I really loved then, but this time it was executed to perfection. The second and last appetiser was a mixture of razor clam, Jalapeño cream, liquorice ice cream, and cucumber espuma. The liquorice flavours were too subtle, but the combination was still wonderful. 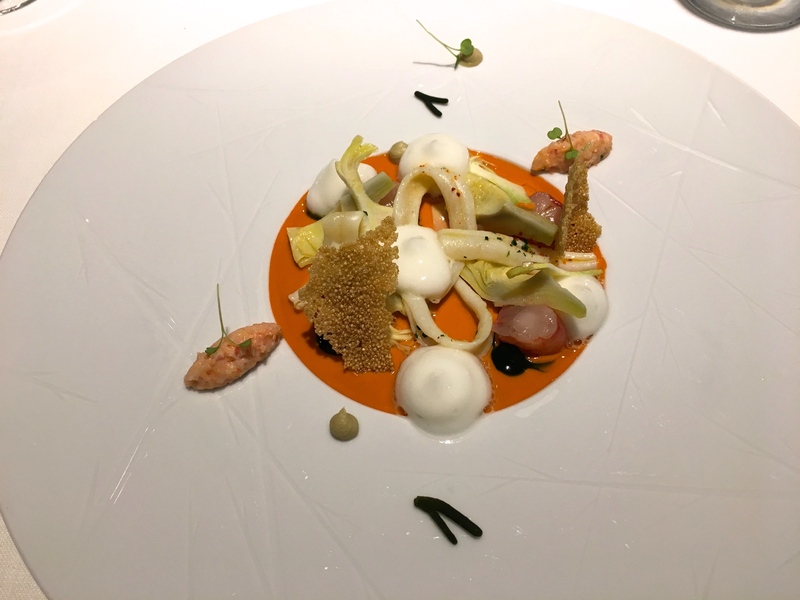 My first course was Carabinero prawn and red curry "royal" (with a flan-like texture) served with tender squid rings, a few pieces of raw Carabinero prawn, artichoke, and five large blobs of apple-celery foam. Plated on the rim of the plate were two mini quenelles of well-seasoned lobster tartare and two dots of artichoke cream. A busy and cluttered plate but the individual flavours of the ingredients were excellent, especially the prawn and curry royal with its complex and intense shellfish flavours and wonderfully balanced heat. 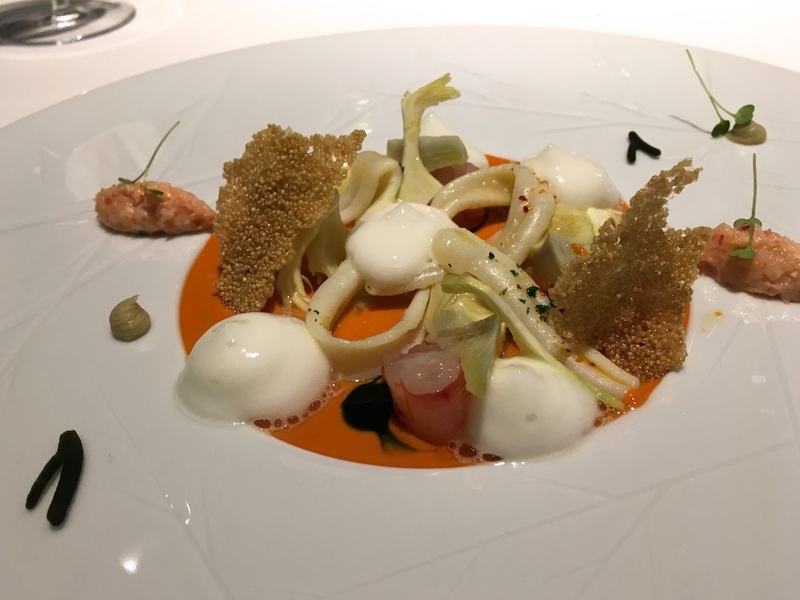 The artichokes were a perfect creamy white, and I loved the delicateness of texture of the apple-celery foam, which balanced the dish out nicely. Next was "Citric risotto", a main course on the a la carte menu, which we had requested to share. 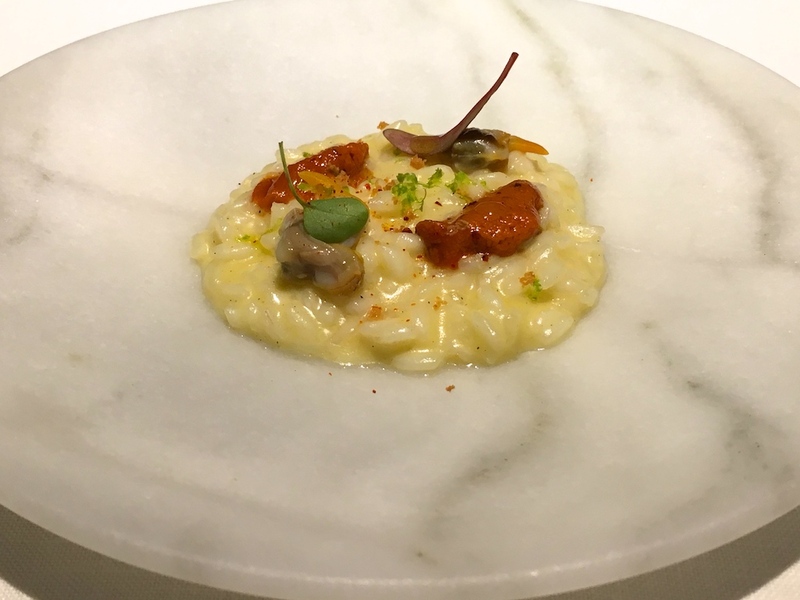 A splendid, well-seasoned risotto with a creamy texture and nice citrus notes, topped with juicy clams, two strips of sea urchin roe, and finished with some piment d'Espelette and fresh lime zest. My main course was sole served with parsnip puree, saffron foam, blood orange gel, barnacles, a mayo-like emulsion flavoured with sole juices and parsley. Also on the plate were some little pumpkin rolls filled with pumpkin puree and topped with thinly sliced octopus. Just like the first course, there was a lot going on on the plate and I found the multitude of elements distracting. However, the sole was expertly cooked with firm and moist flesh and was complemented wonderfully by the sole and parsley emulsion. Dessert was a light and refreshing partnership of mango and mandarin, including a mango-mandarin sorbet, a mango-mandarin puree, mandarin jelly, grapefruit gel, lemon pearls and lemon verbena powder. A perfectly executed dessert with beautiful flavours. 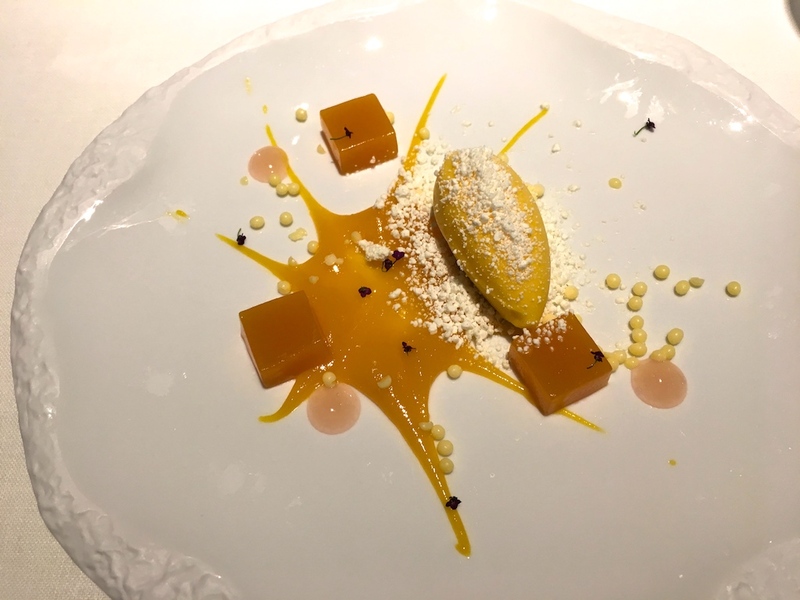 Wonderful mandarin jelly with clean and intense mandarin flavours, but even better was the exquisite mango-mandarin sobert, that a perfect balance between sweetness and freshness and both flavours were equally represented. Compared to my meal five years ago, the cooking at Lasarte has improved significantly. 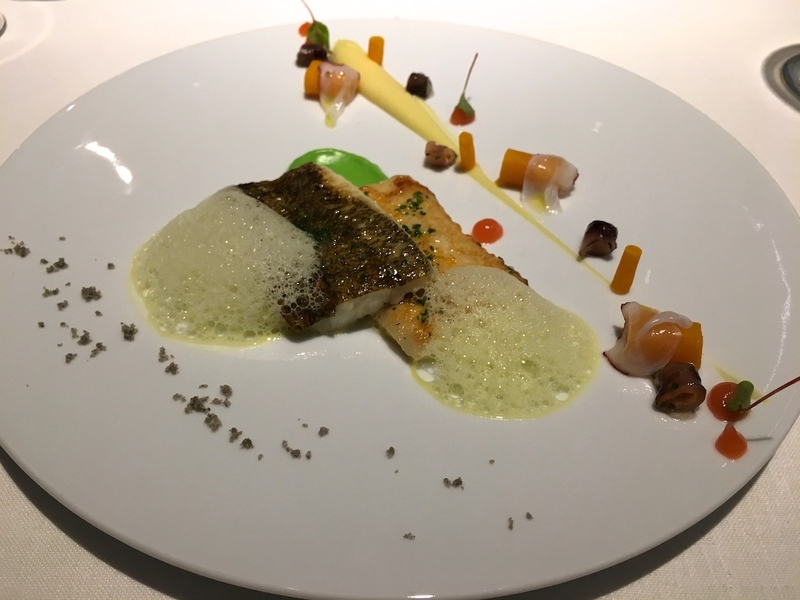 Lasarte is a sophisticated restaurant that delivers a high-end dining experience with a swanky dining room and excellent service, and a lot of work is put into the food. Today's dishes were clearly executed with skill and attention to detail. The food is elaborate in style but not always composed. I have nothing against busy plates per se, but in this case I had the feeling that some of the dishes would have been more focused if one or two ingredients had been left off the plate. Overall today's meal was a very satisfying one, but for me the dishes fell short of three-star level.